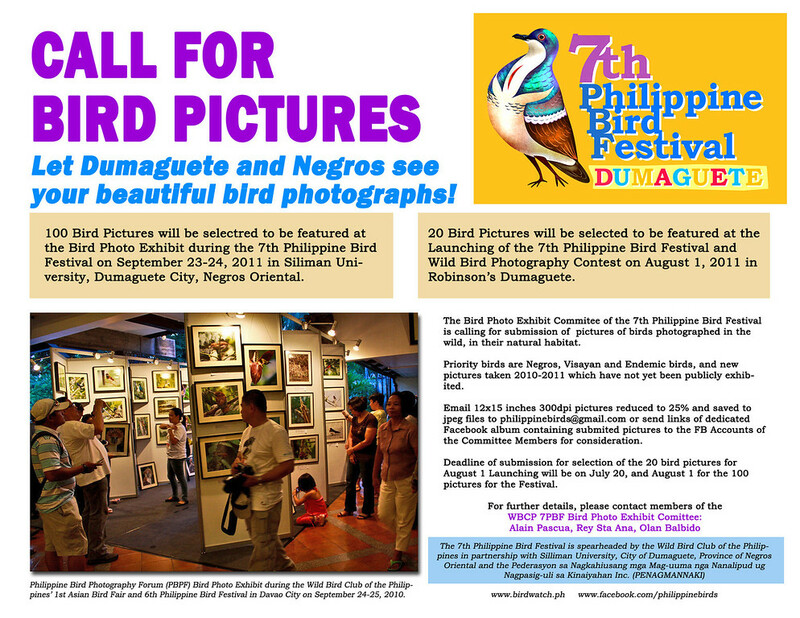 Let Dumaguete and Negros see your beautiful bird photographs! 100 Bird Pictures will be selectred to be featured at the Bird Photo Exhibit during the 7th Philippine Bird Festival on September 23-24, 2011 in Siliman University, Dumaguete City, Negros Oriental. 20 Bird Pictures will be selected to be featured at the Launching of the 7th Philippine Bird Festival and Wild Bird Photography Contest on August 1, 2011 in Robinson’s Dumaguete. The Bird Photo Exhibit Commitee of the 7th Philippine Bird Festival is calling for submission of pictures of birds photographed in the wild, in their natural habitat. Priority birds are Negros, Visayan and Endemic birds, and new pictures taken 2010-2011 which have not yet been publicly exhibited. Email 12x15 inches 300dpi pictures reduced to 25% and saved to jpeg files to philippinebirds@gmail.com or send links of dedicated Facebook album containing submited pictures to the FB Accounts of the Committee Members for consideration. Deadline of submission for selection of the 20 bird pictures for August 1 Launching will be on July 20, and August 1 for the 100 pictures for the Festival.